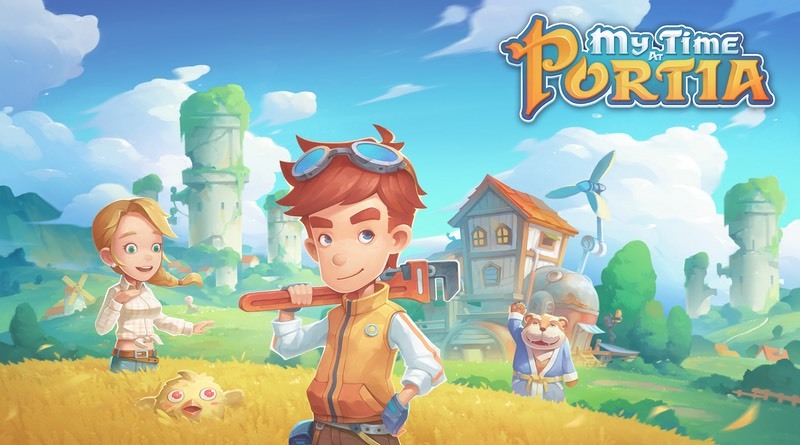 My Time at Portia is a simulation RPG developed by Pathea Games. One look at it and you can tell it’s going for the feel of titles like Story of Seasons and Stardew Valley. Don’t be fooled by such a brief description though; this game has a lot more to offer than just farming and resource management. The variety of activities and tasks you can perform is surprisingly rich, but there are a few issues holding it back from greatness. You begin your adventure upon receiving the deed to your father’s neglected workshop. Here you will create your own character (male or female) and set off for the nearby town of Portia. Your main mission is to restore the workshop to its former glory. To do this you’ll need to raise a farm and complete a host of tasks for the townspeople along the way. There is plenty of side content to explore that is sure to keep you busy. Activities and events are constantly popping up, so don’t be surprised if you get engrossed in exploring dungeons, attending festivals, fishing, mining for ancient artifacts, and even zooming around on a jetpack. There’s plenty to find and do throughout the world over the course of the in-game years you get to play through. One of this game’s strong points is its sense of freedom. From the start of the game you are not tied down to any obligations or forced quests. You are free to do whatever you like, from going on story missions to exploring the open world. You can work on your father’s shop or go straight to setting up a farm. While you will need to complete some story missions in order to open up more sections of the world, you’re never obligated to. Besides the vast open world to explore, there are also a lot of things to do in the small town of Portia. The NPCs go about their normal lives and roam about, making the town feel alive. And you can do a ton of stuff with these townsfolk, from fighting them to building relationships with them. There’s so much to do that it’s impossible to name them all in such a short paragraph. Unlike so many other games in this genre, My Time at Portia features combat. There are two types found here. The first is open world battling, where you venture out and hunt down a variety of colorful creatures to obtain resources. The second type of combat has you challenging citizens to a duel, which takes on the form of an arena sparring match. The problem is the battle system is pretty mediocre because the hit box is all over the place and your opponents can hit you from a mile away. Taking on various creatures is bland and lacks that special connection you find in greater action/adventure games like Zelda. Still, it’s nice that the developers tried something different from the norm and challenging various townsfolk can be entertaining. Right at the beginning I took on an innocent old granny’s farm, but as expected, she wiped the floor with me thanks to her higher level. Not all is flowers and rainbows in the land of Portia. Like many games of this type, you begin the game with virtually nothing. It will take you a long time to slowly amass the necessary tools and resources to progress through the game. The beginning is really slow going, which some will appreciate and others will twiddle their thumbs waiting for the game to “get good”. There’s a severe lack of polish present throughout the game. Bland character designs, poor combat, choppy animations, lack of detailed environments, and more keep this one from reaching its full potential. Small issues abound, such as your character clipping through sections of the environment or when walking over water not leaving behind any ripples really stick out. The attention to detail just isn’t present, and it’s unfortunate. There’s also the issue of long loading times (about a minute), but as of press time they had been reduced by half and it’s a much more pleasant experience now. Despite the lack of polish, it’s hard to deny this game’s sense of charm. The colorful land is very pleasing to look at and exploring is fun. The soundtrack keeps things upbeat and the world feels alive with all of the various characters walking about and performing tasks. Even though the character models could be better, I still became attached to them as the days and weeks pass by. When all is said and done I had a pleasant stay in the world of My Time at Portia. Although it’s a slow burn at the beginning, before long you’ll have no shortage of tasks to complete and places to explore. The simulation aspect of the game won’t be for everyone, but the game is easy enough to understand that almost anyone can find something to like here. While everyone waits with bated breath for Animal Crossing, this one should fill the void nicely until that time is upon us. My Time At Portia is a charming attempt at the Simulation RPG genre. While it has its fair share of flaws that make the game difficult to get into at first, the experience beyond the entry point is nothing short of rewarding. There’s a sincere charm to this game that you don’t often find.